Oklahoma Educators and supporters rally outside the state Capitol on Monday. The Oklahoma teacher walkout and educators’ demands for more school funding dominates the news. It’s unclear if lawmakers are willing to meet those demands and quell daily protests. One lingering question: If schools get more money, what happens to other state agencies and workers who need funding, too? StateImpact Oklahoma's Quinton Chandler and Emily Wendler report on the protests at the Oklahoma Capitol. Oklahoma’s state Capitol has been a madhouse all week. Teachers pack the rotunda early, and by 9 a.m. the chants are loud enough to echo through the tunnels underneath the building. Legislative assistants for the Oklahoma House of Representatives were sent home early Tuesday after lawmakers said protesters became unruly. For the most part, the scene is controlled chaos, with teachers jamming the hallways and lining up to tell their lawmakers why schools need more money. “New textbooks — they’ve not been purchased for 10 years. Only replacements for those that are falling apart,” says Ashley Mackey of Deer Creek Public Schools. She and about 20 others had filed into the office of Rep. Jason Murphey, R-Guthrie. Murphey listened as the group told him about overcrowded classrooms, deteriorating buildings and low wages. Oklahoma’s largest teachers union wants legislators to send more money to schools and backs legislation to allow ball and dice games to increase revenue from casinos and end exemptions on capital gains taxes. Many lawmakers, however, don’t seem to support this. Murphey, for one, thinks consolidating some of Oklahoma’s 500-plus school districts could free up more money for schools. Other lawmakers say they would approve new revenue measures, but they say schools shouldn’t get all of the money because other agencies are suffering from years of budget cuts. State employees, including workers at the Department of Corrections, say they’re hurting as much as public school teachers. By late afternoon on Tuesday, the second day of the teacher walkout, most of the busses chartering educators to and from the Capitol had gone for the day, and the hallways outside the House and Senate chambers were quiet again. Corporal Paul Mullaney and Sergeant Jason Page are practically alone on the third floor of the Capitol’s rotunda. Just hours ago, the gathering area underneath the dome was crammed with rallying educators and supporters. Both men guard inmates at Joseph Harp Correctional Center in Lexington. Mullaney says they came on their day off to tell legislators they deserve higher pay, too. They feel unappreciated. 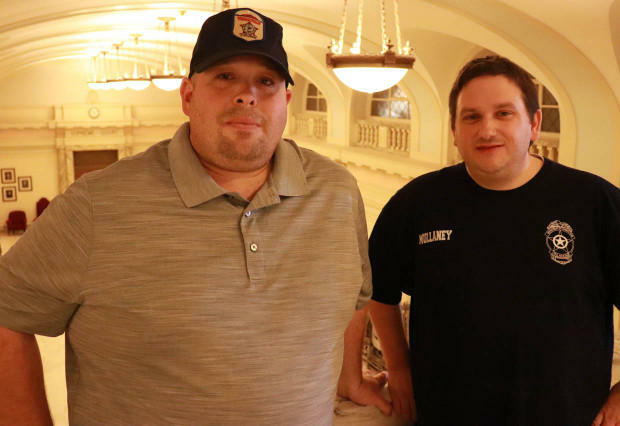 Corrections officers Jason Page and Paul Mullaney inside the state Capitol on Tuesday. Starting pay for a corrections officer is just under $13 per hour. Officers say low pay has worsened staffing shortages at prisons around the state. Mullaney says the shouting at the capitol is drowning their voices out. Page says that’s because corrections officers can’t walk off the job like teachers can. “We took an oath when we graduated from the academy … and we have too much respect to walk out,” Page said. If officers rallied at the capitol instead of showing up to work, it could make prisons more dangerous for guards who stayed behind. State corrections officials say the agency is severely understaffed. In March, DOC needed 728 new officers to fill open positions. More than half of new hires from early 2017 have quit. Workers at other agencies have voiced similar complaints, including employees at the Department of Transportation and the Department of Human Services. 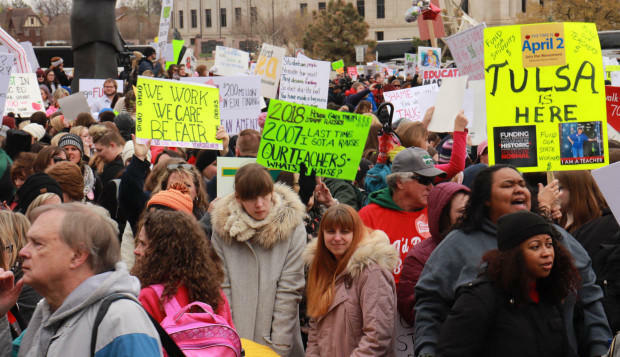 The largest union representing such workers, the Oklahoma Public Employees Association, estimates 600 to 800 state workers joined educators in walkout rallies this week. Like teachers, Mullaney and Page feel like they have been ignored for over a decade. Page says he can’t quit. It took five years for him to get the corrections job and now he has twelve years of service. “I love my job. I’m so damn passionate about my job. I’m invested. I can’t just leave like these young officers can. I can’t just throw it away,” he said. Mullaney has worked for the state for 14 years. He recently got so fed up he turned in his two weeks notice. “I took it back, but that’s how tired people are,” he said. Gov. Mary Fallin recently signed a bill giving public employees making up to $40,000 a year, including corrections officers, a $2,000 raise. Mullaney and Page were aware of the bill but didn’t know it was signed into law. Both of them are skeptical. “I’ll believe it when I see it on paper,” Page said. Editor’s note: This story has been updated to clarify that legislative assistants at the Oklahoma House of Representatives were sent home early because some lawmakers reported unruly behavior from some protestors.